Getting back into the aquarium hobby has brought up memories of my childhood 10 gallon aquarium. That tank brought me much joy growing up. It was a simple setup – a period piece that had an undergravel filtration system driven by an air pump. I went through a few air pumps over the years – always droning away in the corner of my bedroom. 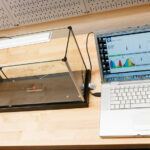 Technology and understanding of aquarium equipment has moved on from the lowly undergravel filter. 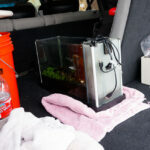 Submerged pumps, canister filters, and other means are the norm for modern aquariums. 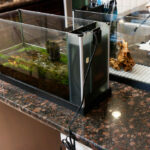 Even our simple Fluval Spec nano aquarium is powered by a sleek submerged pump. 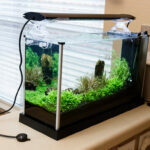 With the advancements, there are still uses for the standby aquarium air pump. I decided to setup a sponge filter for a temporary quarrantine tank and this required a search for an air pump to drive that simple filter. It would be interesting to see how this simple staple of aquariums had changed over the years. My search was limited to looking on Amazon and seeing what got good reviews. 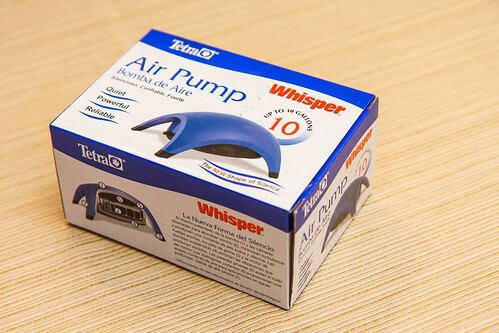 The Tetra Whisper line of air pumps seemed reliable by users, and with a name like ‘Whisper’, I was anticipating a smooth running source of bubbles. 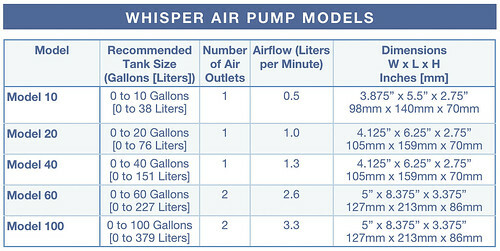 Tetra Whisper air pumps are available in 5 sizes, differing in corresponding airflow capability. Tetra bases their models on the size of aquarium they are suitable for. This is somewhat misleading and would only apply if you needed that airflow soley for filtration on the entire tank, like for an undergravel system. Some people use air pumps to drive supplementary and decorative air features, like bubble wands buried in the gravel, and don’t need airflow for filtration as this is covered separately by a sump system or a canister filter. In this situation, you would not need the Model 60 for your 60 gallon aquarium, you would need a pump with enough air capacity for the specific devices you are driving. The table below shows the differences in the 5 models. 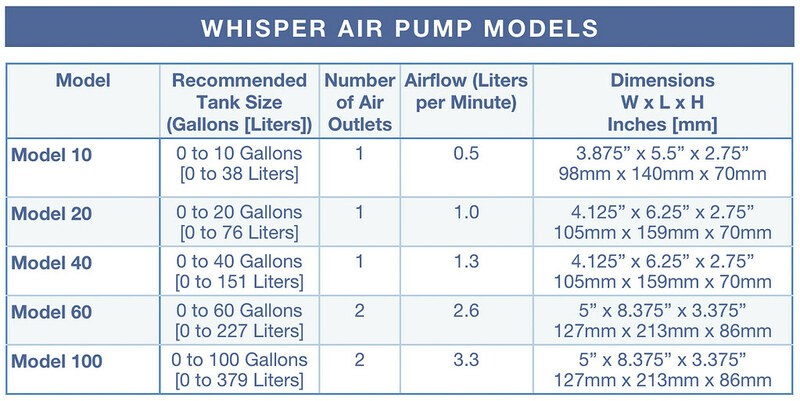 Of note is the rated airflow of each pump in liters per minute. This may be more helpful in selecting the pump for your needs. However, and also very frustrating, most air stones, sponge filters, and other air driven devices don’t have their required airflow listed. My experience tells me that 0.5 Liters per minute will drive almost any single airstone or similar air driven device. If you have five similar devices to drive, look for around 2.5 Liters per minute, which for this line of air pumps, puts you into the Model 60. Whisper Model 10 – suggested for aquariums up to 10 gallons (38 Liters). The pump has a single air outlet and produces 0.5 Liters per minute of airflow. Whisper Model 20 – suggested for aquariums between 10 and 20 gallons (76 Liters). The pump has a single air outlet and produces 1.0 Liters per minute of airflow. Whisper Model 40 – suggested for aquariums between 20 and 40 gallons (151 Liters). The pump has a single air outlet and produces 1.3 Liters per minute of airflow. Whisper Model 60 – suggested for aquariums between 40 and 60 (227 Liters). The pump has two air outlets and produces 2.6 Liters per minute of airflow. Whisper Model 100 – suggested for aquariums between 60 and 100 (379 Liters). The pump has two air outlets and produces 3.3 Liters per minute of airflow. 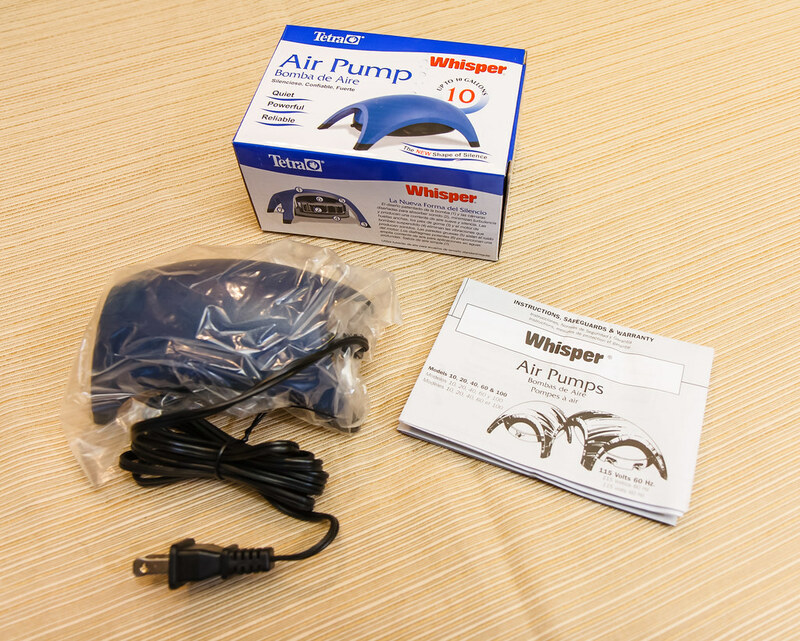 I did not have to spend much time fretting over what size of Whisper air pump I needed. Our use of the air pump would be to drive a small sponge filter for a quarantine tank to house the critters during a rescape. I knew that this one device would not need any more air than what was provided by the smallest in the lineup, the Model 10. The Model 10 comes boxed with the air pump and some instructions. There are no other accessories with this unit. The air pump comes with a 6 foot long (1.8 meter) cord topped with a 2 prong plug. I thought it was nice to give a cord of decent length. The pump has a very nice shape, much different than the air pumps of my childhood, which were simply plastic boxes with a rubber base. 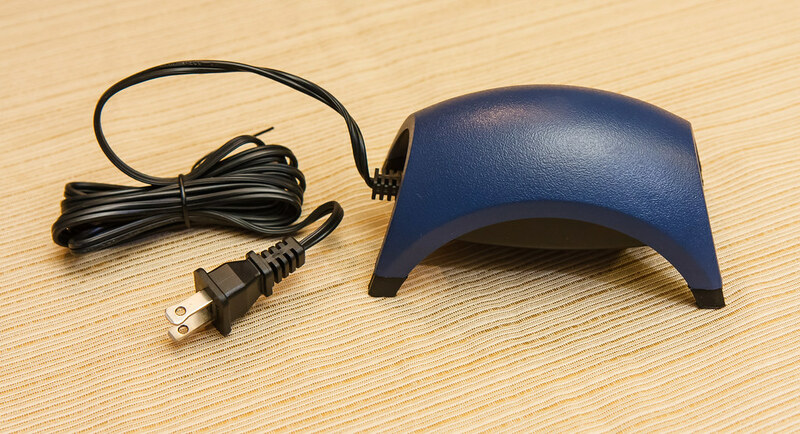 It has a modern, rounded shape with a blue, plastic top. This top curves down to four legs that are supported by rubber feet, a critical component in isolating the vibrations of the unit. At the bottom of the air pump you can see the air inlet obscured from the inside by an air filter of sorts (small white circle). The instructions don’t indicate this is a removable air filter or that it requires any maintenance. The Model 10 has a single air outlet (like the Model 20 and 40, but unlike the dual outlet Model 60 and 100). It accepts standard 3/16″ aquarium air tubing. In Use – Whisper Quiet? Having this air pump setup makes me very thankful for the filtration system of our Fluval Spec V. It showcases just how quiet that system is and demonstrates that powerbeads, pumps, and other water driven systems tend to be much quieter and more efficient than air driven systems. Before we talk about the noise, let’s talk about performance. Using the pump is as simple as setting up your various air devices, tubing, valves, etc. and plugging the pump in. The Model 10 had plenty of airflow to produce very strong bubbles up the lift tube of our sponge filter. The resulting flow was impressive; I think that the airflow from this pump could be divided to serve two sponge filters. The pump was consistent in flow and worked great. The noise from the pump, when compared to the Spec V’s filter, was noticeable and noisy to my ears. Again, this is just because of comparison as I cannot hear any noise from the Spec pump from more than 10″ away. The Whisper air pump, on the other hand, was immediately noticeable. It prompted me to try and hide the pump inside our equipment box to help dissipate the sound. In defense of the Whisper Model 10, it is very quiet when compared to any other air pump and you would be hard pressed to find one more quiet. I tried to use the sound meter on my iPhone to see just how noisy it is. Measured from a very close distance of a foot, the sound power level jumped from 36 dB (ambient) to 46 dB with the pump on. 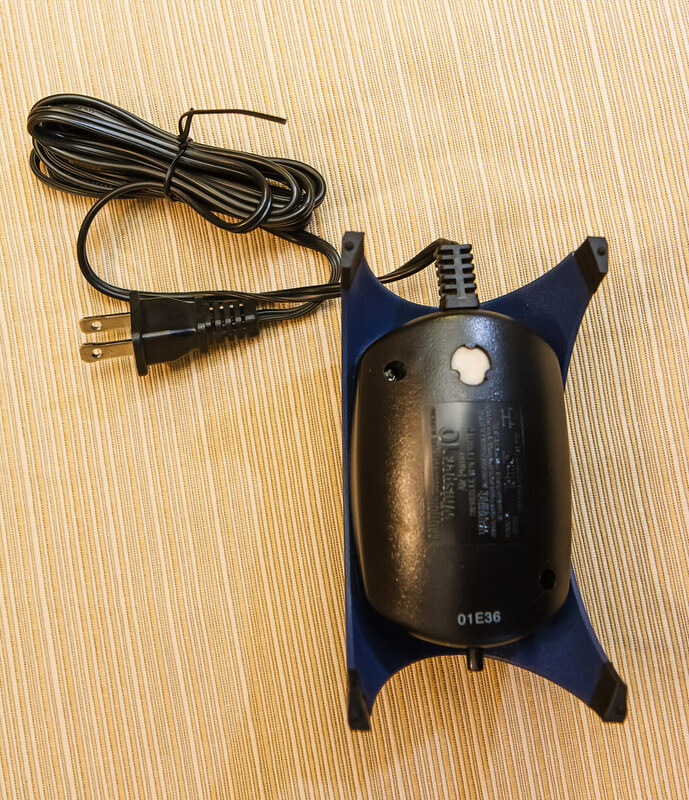 A few thoughts on setting up an air pump. This one in particular seems prone to wander around from vibrations. It’s important to set it up on a level surface and give it some elbow room to work. If it is placed too close to other objects it might migrate over time and make contact. If the plastic body of the air pump makes contact with anything, the noise will triple and be very noticeable and annoying. Also important in setup is to consider using a check valve . 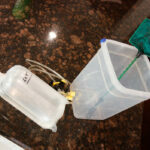 This is something I failed to do but will make sure to alleviate the next time I setup a tank with this pump. If you have the air pump positioned below the top level of the water, you need to place a check valve in the line. This will stop water from flowing backwards into the air pump. This can very easily happen if the power goes out unexpectedly; the water will then siphon backwards and fill the air pump. This will damage the pump and might set a course of events (given enough time) of emptying your aquarium water. Purchasing a gang valve of some sort is also a good idea. 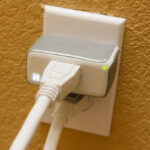 It can give you the ability to divide your air among several devices and modulate the airflow between them. Even if you only use one device, you can still put the gang valve inline to modulate the airflow downwards if you need to for a particular device by bleeding off some air at that valve. 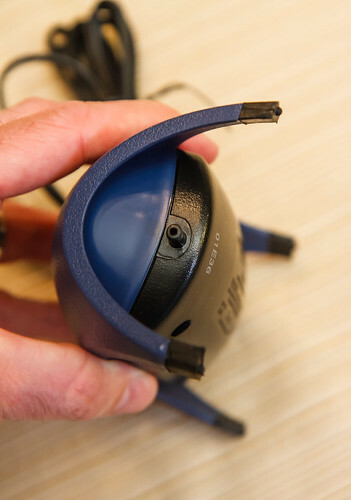 While it doesn’t apply to the Model 10, if your Tetra Whisper air pump has dual outlets and you don’t need to use the second outlet, place a short section of air tubing over the unused outlet anyway. This will greatly attenuate the sound to make the unit quieter. 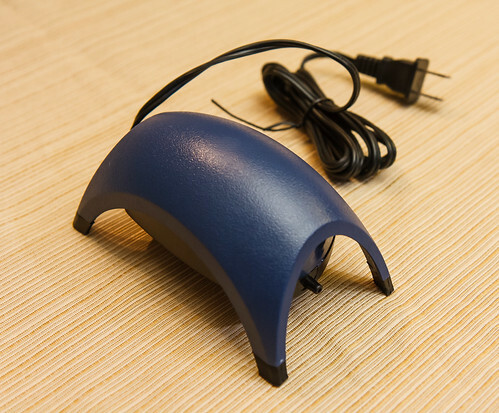 I like the Whisper 10 very much and would highly recommend it for general aquarium use in driving aquarium air equipment. I can’t think of anything to improve on this device. The only wish I have is that Tetra would make available a tool to help you determine how much airflow you need for a particular setup. I understand this is difficult as the required air pump capacity greatly fluctuates with many setup factors. The pricing is very good for the Whisper lineup; the 10 gallon to 100 gallon capacities are only separated by about $11 USD and the pumps start at around $10 USD. Having said all that, if you find you have to use an aquarium air pump, I can recommend the Whisper series as they are a good design and offers great performance at reasonably low sound levels. 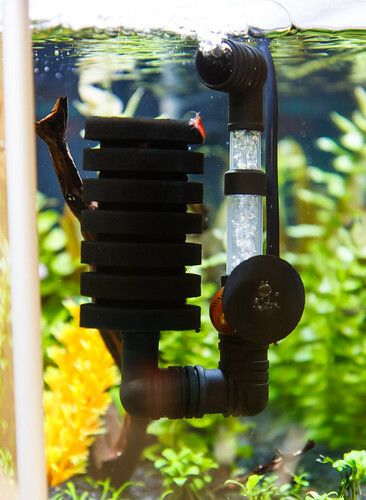 This entry was posted in Product Reviews and tagged aquarium, check valve, gang valve, sponge filter, tetra air pump, undergravel, whisper air pump. Bookmark the permalink.